Hey everybody! We just got back from a hike with our kids and I’m finally sitting down to do some planning. I did cook last week, but not really anything from the menu. I think I was just trying to use up foods we already had. So, I have a few repeats from last week’s menu, sorry about that! That’s life! – Food truck night at the kids’ school! Sharing time! 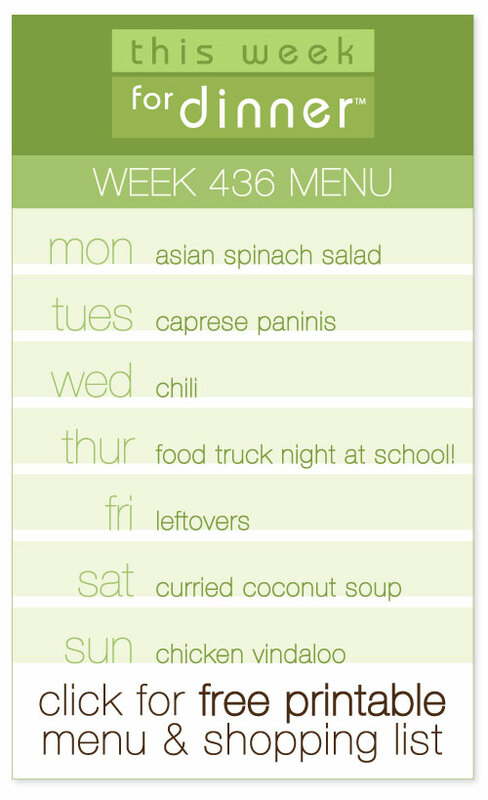 Let’s see what you’ve got cookin’ this week! Remember, all menus welcome! Fancy, simple, month-long, week-long, gluten free, whatever! I love that you have “Food Truck Night”. That is so not an option where we live, unless it is Saturday morning and you go to Big Town for something. I think that is a great resolution – hope it goes well, it’s so hard to go to bed early! We just got back from Spain last night. I’m (mostly) back on US time now. Luckily we don’t have to do any grocery shopping – thanks to the grandparents. hope spain was amazing and that jet lag week hasn’t been too rough! Friday – out first friday ! Thursday – College Graduation Night Out!!! Monday-Omelet Bar…fillings include bacon, mushrooms, onions, pepper jack or cheddar cheese, and bell peppers. Served with fresh fruit. How fun to have a food truck night at the school. Great idea.